The policies the Government is pursuing could well render unemployable all those who are self-employed now. There appears to be an inherent bias against the self-employed, who are being driven out of their vocations without any re-training or alternative skill development. R. Vaidyanathan presents the case of the self-employed. THERE is a major debate going on regarding the Employment Guarantee scheme (EGS) and the usual slogans like kick-starting the economy, increasing saving rate, reducing tax rate, and bringing down fiscal deficit are being mouthed. The EGS is expected to reduce unemployment, create enduring assets, augment rural income, provide an antidote to inflation and channel community efforts. But the largest segment of labour is self-employed and the government policies are sure to pauperise them. Table 1 gives the share of different groups in the national income pie. The so called unorganised sector consisting of Proprietorship and Partnership firms (P&P sector) constitutes nearly 38 per cent of the National Income, while corporate groups form hardly 14 per cent and government 24 per cent. The P&P sector is dominant in service sectors such as construction, trade, non-Railway transport, hotels and restaurant, and other services. These are the fastest growing sectors in the economy. Since private sector executives, editors of English language newspapers and Bureaucrats — all belonging to “Employee Groups” — are opinion makers and policy formulators, the travails of self-employed are neither fully comprehended nor debated. 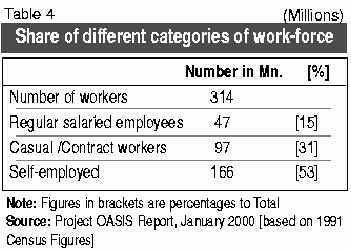 The share of the self-employed in savings is significant and in India it is included in the household sector. From Table 2 it is clear that nearly 94 per cent of the national savings comes from Households and of this at least 70 per cent from non-salary groups, that is, the self-employed. Table 3 gives the share of different sectors in credit off-take from banks. In spite of the significant share of Households in savings and National Income its share in credit off-take has declined from 58 per cent in 1990 to 43 per cent in 2002. In other words, the commercial banks have turned away from the self-employed groups. 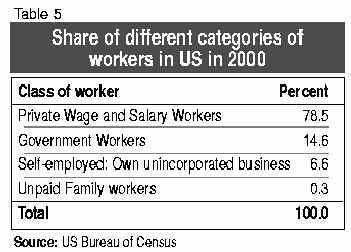 From the point of view of employment, Table 5 shows that the self-employed constitute more than half the workforce which is in contrast to the US situation where only 7 per cent is in this category, as seen from Table 6. Hence many a policy pertaining to labour, which are useful in the Western context may not be appropriate to our situation. The exhaustive Economic Census 1998, conducted by the Central statistical Organisation (CSO) covered 30.35 million enterprises engaged in different economic activities other than crop production and plantation. It deals with own account enterprises as well as establishments, enterprises run by employing at least one hired worker. It covers private profit and non-profit institutions, cooperatives, and all economic activities including Dharamshalas/temples. Table 7 gives the salient findings on the ownership of the enterprises, both own account enterprises and establishments employing labour. This encompasses manufacturing, construction, trade, hotels, restaurant, transport, finance and business and other services. The Enterprise Survey reveals that of the total of 28.6 million private enterprises in the country, 24.39 million (85 per cent) were self-financing. This speaks volumes about our credit delivery systems to these self-employed groups particularly belonging to the vulnerable sections. The survey also points out that the overall growth rate of enterprises owned by persons belonging to the SC category has declined significantly from 3.42 per cent during 1980-1990 to 0.40 per cent in 1990-98. The decline is observed both in rural and urban areas but in the former the growth is even negative (-0.41per cent). This is an issue which needs debate and detailed study by policy planners. Is the decline due to migration of the SC segments to the urban areas or due to inadequate credit availability? 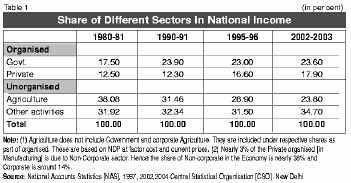 In contrast, the growth rate of enterprises owned by persons belonging to the ST category has significantly increased from 4.16 per cent (1980-90) to 6.64 per cent (1990-98). The increase is sharp in the urban areas from 2.37 per cent to 12.24 per cent. This is interesting. The reasons for such growth also needs study by planners for replicating those cluster efforts. Instead of fostering credit delivery at affordable cost and enhancing self-employment the policy planners are keen to create a huge mass of unemployable persons by their policies. There was a small news item a few days ago on the Supreme Court nod for “smart licence plates”. The estimated 80 million vehicles in India are to get electronic number plates for easy monitoring. Each electronic plate would cost Rs 500 to Rs 1000 (depending on the vehicle) and totals to Rs 4000-8000 crore. Apparently four major companies are set to make huge income in this business This is for the existing stock of vehicles and for future the business will grow due to growth in automobile sector. Millions of persons who were painting and/or engraving licence plates will become redundant. That is, 240-400 million-man hours of work will be rendered redundant (assuming 3 to 5 hours per plate) in the next few years since at least once in four years these are re-done. There has not been any attempt to re-train or impart newer skills to these persons in other activities to face the challenges of the reforms. Sadly there has been no debate, discussion or even comment. The self-employed appears doomed. The country may end up with having a huge mass of unemployable persons who are currently self-employed. The policies to be adopted in the service sector in retail trade, restaurants, construction, road transport and so on are going to require massive employment guarantee schemes (EGS) even in urban areas which will make the state wither away. The pity of this idea of poverty removal is that the Government will render unemployable all self-employed and then the EGS will be implemented. It is literally EG(G)S on all our faces.